Lineage of Grace, a critically acclaimed Historical Fiction series by romance author Francine Rivers, traces the women in the lineage of Jesus. - Publisher Unspoken is the fourth book in this series. Bathsheba, a name that to many, means seduction and sin, a name to remain unspoken! But, God called Bathsheba his own, worthy of the legacy of his Son. Who was this woman who so entranced David the King that he sinned greatly for her? And, who was this woman who gave birth of Solomon, wise king of Israel? 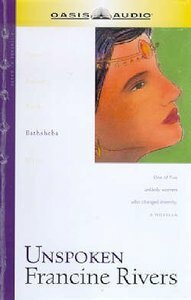 Francine Rivers, with her hallmark touches of brilliant prose and gripping characterizations, tells Bathsheba's story in a way you've never heard before. Remaining true to the facts given in Scripture, Bathsheba is brought to life, to speak to us in new and life-changing ways. This is her story, a journey from innocence to despair, and on to hope in the God who restored her. About "Unspoken (Abridged, 2 Cds) (Bathsheba) (#04 in Lineage Of Grace Series)"
Unspoken is the fourth book in this series. Bathsheba, a name that to many, means seduction and sin, a name to remain unspoken! But, God called Bathsheba his own, worthy of the legacy of his Son. Who was this woman who so entranced David the King that he sinned greatly for her? And, who was this woman who gave birth of Solomon, wise king of Israel? Francine Rivers, with her hallmark touches of brilliant prose and gripping characterizations, tells Bathsheba's story in a way you've never heard before. Remaining true to the facts given in Scripture, Bathsheba is brought to life, to speak to us in new and life-changing ways. This is her story, a journey from innocence to despair, and on to hope in the God who restored her.